At the 2018 PEN America Literary Gala, Stephen King will receive the 2018 PEN America Literary Service Award. The award is presented annually to a critically-acclaimed author whose work embodies PEN America’s mission to oppose repression in any form and to champion the best of humanity. 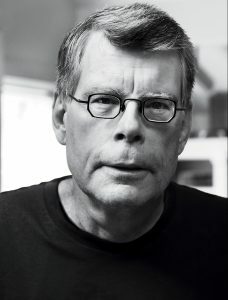 Stephen King is the author of more than 50 books, all of them worldwide best sellers and many—including such classics as It, The Stand, The Dark Tower, Misery, Lisey’s Story, 11/22/63, On Writing, Under the Dome, and many more—providing the basis for major motion pictures and serving as cultural hallmarks for generations. Among his many accolades are the 2003 National Book Foundation Medal for Distinguished Contribution to American Letters and the 2014 National Medal of Arts presented by Barack Obama. His depictions of horror and violence have also earned him a title as one of the most banned or challenged authors in recent decades. King is an impassioned advocate of freedom of expression, literacy, and access to information, which he and his wife Tabitha support through their philanthropy. King’s Haven Foundation also provides unique and generous support to writers and other freelancers in the arts who have suffered personal hardship. His outspoken defense against encroachments on free speech and pointed public criticism of policies that infringe on this and other rights have resulted in his being blocked by President Trump on Twitter. Scribner will release King’s newest novel, The Outsider, on May 22, the day of the PEN America award presentation. In a 2016 report Missing from the Shelf: Book Challenges and Lack of Diversity in Children’s Literature, PEN America found that books by or about people of color, people who identify as LGBT, and people with disabilities are significantly more likely to be challenged or banned even as they make up a disproportionately small fraction of all published literature. On December 14, 2017, the FCC voted to roll back regulations safeguarding net neutrality—a decision that will impair the free expression that the internet has made possible. PEN America’s Trump the Truth timeline continues to track important developments during the Trump Administration that threaten to undermine free expression and press freedoms from January 20, 2017, to the present.